Background Gastroparesis is a difficult-to-treat motility disorder with a poor response to medical therapy. Gastric peroral endoscopic pyloromyotomy (G-POEM) has been offered as a novel therapy in the treatment of refractory gastroparesis. We present a multicenter case series of our experience with G-POEM. Methods This is an international multicenter case series of patients who underwent G-POEM for the treatment of gastroparesis. The severity of gastroparesis was assessed by delayed gastric emptying scintigraphy (GES) and an elevated gastroparesis cardinal symptoms index (GCSI). Patients then underwent G-POEM using the submucosal tunneling technique. The primary endpoint was improvement in the GCSI score and improvement in gastric emptying on repeat scintigraphy. 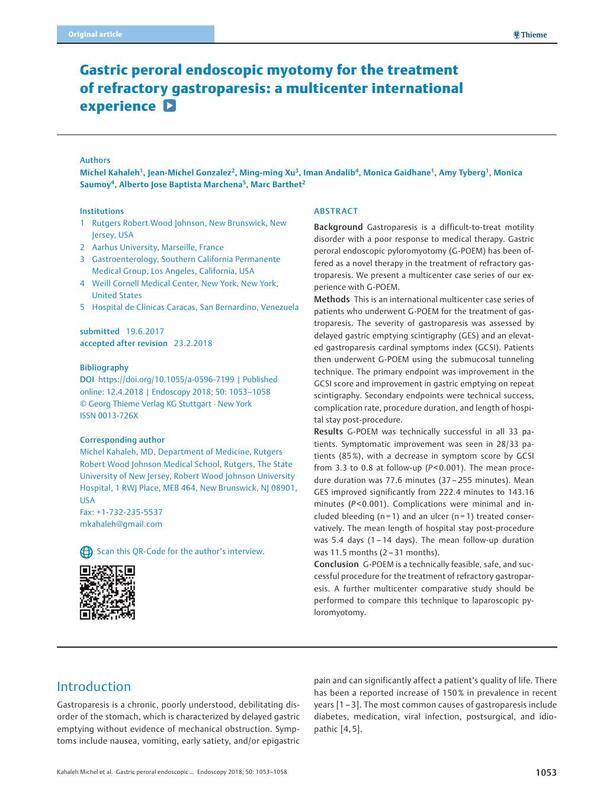 Secondary endpoints were technical success, complication rate, procedure duration, and length of hospital stay post-procedure. Results G-POEM was technically successful in all 33 patients. Symptomatic improvement was seen in 28/33 patients (85 %), with a decrease in symptom score by GCSI from 3.3 to 0.8 at follow-up (P < 0.001). The mean procedure duration was 77.6 minutes (37 – 255 minutes). Mean GES improved significantly from 222.4 minutes to 143.16 minutes (P < 0.001). Complications were minimal and included bleeding (n = 1) and an ulcer (n = 1) treated conservatively. The mean length of hospital stay post-procedure was 5.4 days (1 – 14 days). The mean follow-up duration was 11.5 months (2 – 31 months). Conclusion G-POEM is a technically feasible, safe, and successful procedure for the treatment of refractory gastroparesis. A further multicenter comparative study should be performed to compare this technique to laparoscopic pyloromyotomy.